We're basically at the end of December, which means it's just about the end of 2016. How insane is that? This year has been incredible, and I'm grateful for the experiences and the people and the books that have made this year amazing. I'm grateful for every single one of my readers as well, as it's truly an honor to know that people are actually out there reading all of my thoughts. Thank you, for the gift of your time and your attention. Anyway, as the temperatures continue to drop, and as majority of us experiencing that cozy up at home with books, laptops, blankets, socks and hot drinks, I wanted to take a moment to share what's been happening this month! I love December, particularly because it means two things to me: quality time with the folks I love, and the holidays. I'm one of those people who loves the holidays, and I go all out when it comes to gifts, decorations, music and celebrations. 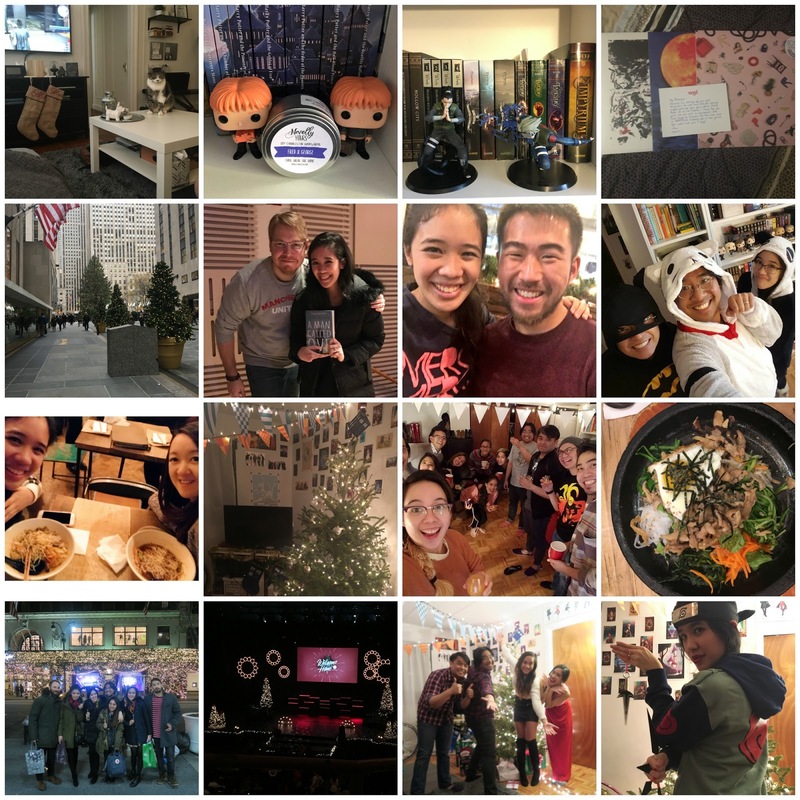 In spite of the fact that it got real cold, I definitely thought this month was full of fun and good cheer - multiple celebrations for the holidays, and a visit from my favorite (and only) brother-in-law to make things even more wonderful. We went all out for Christmas weekend, so we're going to be pretty relaxed for this upcoming New Year's weekend. Hope you guys have had a wonderful month, and wishing you an incredible year to come! I read a ton of books in the first half of the month, which I suppose is a great thing since I barely read anything in the last two weeks. That's what happens when you're busy with family and friends and the holiday celebrations that pepper this time of year! I did manage to read some real gems though, so here were my favorites of the month. I've managed to read a fair bit of fantasy this month, including: Spindle, Geist, Brightly Woven, Caraval, The Girl in the Tower, The Book Jumper, Roseblood, The Cursed Queen and Windwitch, as well as the three Pottermore e-books. What did you read in December for Flights of Fantasy? Don't forget to share your monthly recaps and reviews in the Linky below!